The first hybrid shark ever discovered: the mating of the two species – local Australian black-tip shark with its global counterpart, the common black-tip – was an unprecedented discovery with implications for the entire shark world. The world’s first hybrid sharks have been discovered off the Australian coast, scientists say. Researchers found 57 of the new sharks along 1200 miles of coastline between New South Wales and Queensland, with the interbreeding possibly a response to climate change or fishing patterns. 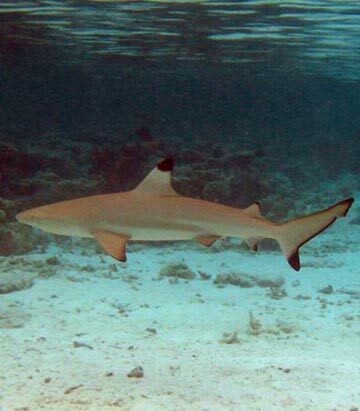 The mating of the two species – local Australian black-tip shark with its global counterpart, the common black-tip – was an unprecedented discovery with implications for the entire shark world, said lead researcher Jess Morgan. Like its two parent species, the new shark is not considered dangerous – and scientists say there is no risk of the hybrids leading to a Jaws-style “mega-shark”. The hybrids were found at five locations and identified using genetic testing and body measurements. While the two parent black-tip species are closely related, they grow to different maximum sizes and are genetically distinct. Colin Simfendorfer, a research partner from James Cook University, finding the hybrids was “very unusual”. “Telling the hybrids is extremely difficult, which is why it has never been done before,” he told ABC Radio. Simfendorfer said hybrids were often sterile but there was evidence the new sharks have been breeding both with each other and with members of the separate black-tip species. Surprisingly, he said, the hybrids are not the average size of the two interbred species but tend to be roughly the same length as one species or the other. A Queensland marine scientist, Dr Jennifer Ovenden, told the Telegraph the sharks may be adapting to changes in the environment and other closely related sharks and rays may also be interbreeding. “Wild hybrids are usually hard to find, so detecting hybrids and their offspring is extraordinary,” she said. MELBOURNE: Researchers have discovered the world’s first hybrid sharks in Australian waters, indicating that animals are adapting to climate change for survival.Leading researchers in marine biology have come across 57 animals along a 2,000-km stretch from Queensland to New South Waleswhich they believe are the result of cross-breeding between the common black-tip shark and Australian black-tip shark, two related but genetically distinct species.The inter-breeding between the two species shows that the animalsare adapting to climate change and the hybridization can make the fishes stronger, the scientists said.”Hybridization can enable sharks to adapt to ecological change as the smaller Australian black-tip currently favours tropical waters in the north while the larger common black-tip is more abundant in sub-tropical and temperate waters along the south-eastern Australian coastline ,” Jennifer Ovenden of Queensland department of primary industries and fisheries said. “Wild hybrids are usually hard to find, so detecting them and their offspring is extraordinary. To find 57 hybrids along 2000-km of coastline is unprecedented ,” she said. The find was made during cataloguing work off Australia’s east coast when genetic testing showed certain sharks to be one species when physically they looked to be another. Colin Simpfendorfer of James Cook University’s Fishing and Fisheries Research Centre, said the results of this research show that we still have a lot to learn about these important ocean predators. Some feared predators off the Australian coast appear to be adapting. A team of Australian scientists says it has identified 57 sharks that appear to be the result of mating between two species, making them the first-ever hybrid sharks identified in the wild. The scientists say the hybrid sharks are a combination of the common blacktip shark and the smaller Australian blacktip shark, which lives in warmer tropical waters near the coastline. The researchers say the new, hybrid sharks live along a 200 kilometer stretch of Australia’s northeastern coast but have ventured more than 1,600 kilometers south, to cooler waters. The scientists say they do not know for certain why the two species started interbreeding but suggest it may be an evolutionary process to adapt to climate change or pressures on their food supply. The findings appear in the journal Conservation Genetics. This entry was posted in Uncategorized and tagged . Colin Simpfendorfer of James Cook University's Fishing and Fisheries Research Centre, Climate change: Hybrid sharks mark survival strategy, Dr Jennifer Ovenden, Hybridisation, larger common black tip, smaller Australian black tip, weehingthong, Wild hybrids are usually hard to find. Bookmark the permalink.